The ancients better appreciated the importance of the Apple than do the moderns, who treat it chiefly as "the embryonic condition of cider or as something to be metamorphosed into pies." It is said to be indigenous to every part of the inhabited globe except South America and the islands of the Pacific. It is equally at home in the fierce heat of the equator and among the frosts of Siberia. In olden times the fig was the index of a native civilization. Later on, the vine was king, but at the present time there are many who maintain that the apple is the only genuine index of civilized man, and claim that it flourishes best in those regions where man's moral and intellectual supremacy is most marked. The Athenians made frequent mention of the cultivation of the apple, and Pliny enumerates twenty varieties that were known in his day. It is generally supposed that the Goths and Vandals introduced the manufacture and use of cider into the Mediterranean provinces, and references to it are made by Tertullian and the African Fathers. The use of cider can be traced from Africa into the Biscayan provinces of Spain, and thence to Normandy. It is supposed to have come into England at the time of the conquest, but the word "cyder" is said to be Anglo-Saxon, and there is reason to believe that it was known in the island as early as the time of Hengist. As the mistletoe grew chiefly on the apple and the oak, the former was regarded with great respect by the ancient Druids of Britain, and even to this day, in some parts of England, the antique custom of saluting the apple trees in the orchards, in the hope of obtaining a good crop the next year, still lingers among the farmers of Devonshire and Herefordshire. During the Middle Ages the fruit was made the pretext for massacring the oppressed tribes of Israel, as it was supposed that the Hebrews used apples to entice children into their homes to furnish their cannibal banquets. The different varieties of apples have all descended from a species of crab found wild in most parts of Europe. 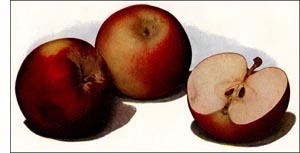 Although there are two or three species of wild crab belonging to this country, yet none of our cultivated varieties have been raised from them, but rather from seeds of the species brought here by the colonists from Europe-over two hundred varieties of apples are known at the present time. As a rule, the apple is a hardy, slow-growing tree, with an irregular head, rigid branches, roughish bark, and a closegrained wood. It thrives best in limestone soils and deep loams. It will not flourish in wet soils or on those of a peaty or sandy character. As a rule, the trees live to be fifty or eighty years of age, but there are specimens now bearing fruit in this country that are known to be over two hundred years old. The wood is often stained black and used as ebony. It is also made into shoe lasts, cog-wheels, and small articles of furniture, and is greatly prized in Italy for wood carving and statuary. New and choice varieties of apples are derived from seeds planted to produce stocks. One stock in ten thousand may prove better than the original, and its virtues are perpetuated by layers, cuttings, graftings, and budding. The tree is not subject to disease. Insects, notably the borer, the woolly aphis, the caterpillar, the apple moth, and the bark louse, have to be guarded against, and several blights occasionally attack the foliage, but as a rule small loss is experienced from these sources.